Avalanche Canada has issued a Special Public Avalanche Warning, in effect immediately. The warning is widespread and applies to all the forecast regions in western Canada. For a detailed view of the regions involved click here for map (also posted on page 3 of attached pdf). Due to the major warming trend this week and the persistent weak layers in the snowpack, people are cautioned to select Simple Terrain. Simple Terrain implies lower angled slopes generally under 30 degrees where multiple options exist to eliminate your exposure to avalanche terrain. In forested areas, keep an eye up for tree bombs as vegetation will continue to shed snow from their limbs over the next few days. Those heading to the mountains for work or recreation should also be aware that many popular summer trails are exposed to avalanche terrain. Plan ahead and research your route to make sure you are avoiding these areas. 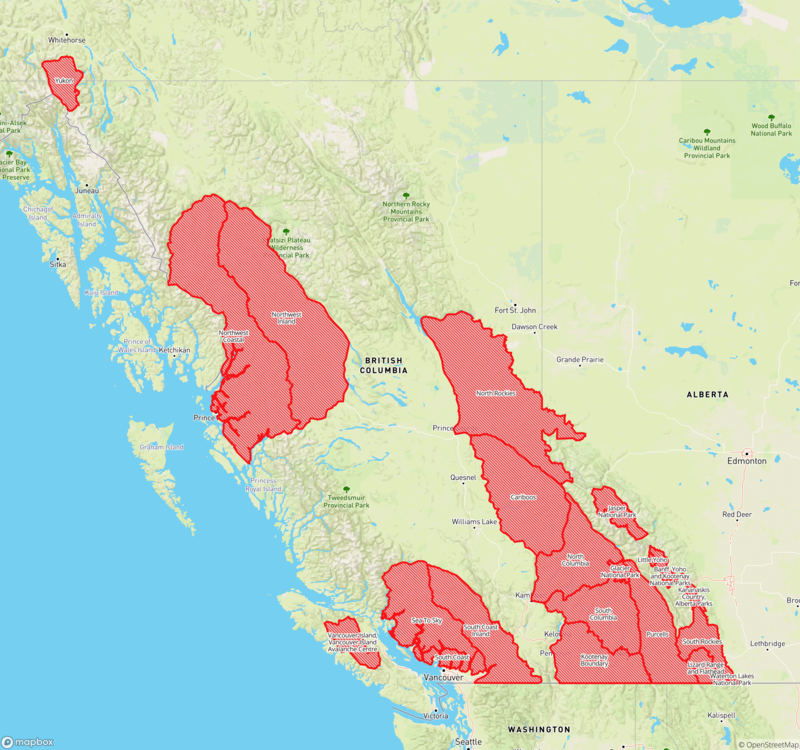 There is a Special Public Avalanche Warning (SPAW) on Vancouver Island due to the sustained warming trend taking place for the next several days on the coast. •	Cornice Fall - Above mountain top freezing levels will further weaken cornices that developed over the past week from extreme winds and new snow. Be very cautious in terms of your route selection and do not travel below slopes with overhead exposure from cornices. •	Wet Slab - Recent snowfall and wind events from this past week may provide appropriate bed surfaces for initiating avalanches due to major heating trend over the next few days. Slopes steeper than 30 degrees that received rainfall or wet snow will be further aggravated by rising warm temperatures. •	Loose Wet - The increase in temperature will add increased stress to the upper snowpack. Expect isothermal type conditions below treeline as the upper snow pack has undergone a major temperature shift from cold to warm and snowfall to rainfall. Slopes steeper than 30 degrees are now exposed to a major warming trend over the next few days and will become very likely areas to trigger avalanches. •	Deep Persistent Slab - Two persistent weak layers (PWL’s) down 40-60cm and 60-80cm (depending on aspect and elevation) will become likely to trigger on unsupported terrain steeper than 30 degrees. The upper snowpack will begin a sustained melting process for the next few days which will bring additional load and stress to these PWL’s, further increasing the likelihood of triggering. •	Persistent Slab - There are several reactive persistent weak layers in the upper 60cm of the Vancouver Island snowpack. These issues will become increasingly more hazardous with forecasted wind loading (Thursday), rain loading (Friday) and the general warming air temperatures this weekend. Be extremely vigilant as these layers remain a main concern despite no new reports of human triggered avalanches. As temperatures rise, expect the likelihood of triggering to increase for these layers. Recommended Preventative Actions: Avalanche Canada warns all backcountry users to keep careful track of their regional avalanche forecasts at www.avalanche.ca. Everyone in a backcountry party needs the essential rescue gear - transceiver, probe and shovel - and the knowledge to use it. (b) if the avalanche risk assessment indicates that a person working at the workplace will be exposed to a risk associated with an avalanche, a written avalanche safety plan is developed and implemented. (3) The avalanche risk assessment must be conducted by a qualified person.